Throughout the history of art, there have been artists, who, although they did not have a long career, established themselves as a master of a genre. That is true of early Italian Renaissance master sculptor Desiderio da Settignano. Just look at this work and see why he is considered by many scholars to have been the greatest sculptor of children in the history of art. Personally, as an art historian, I am hard-pressed to name another sculptor who managed to capture the fragile, beautiful nuances of a child’s physiognomy as Desiderio did. 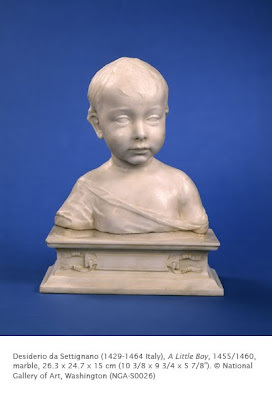 The only artist of whom I can think who approaches Desiderio’s sense of empathy in his depiction of children, is contemporary sculptor John Ahearn. The Italian Renaissance evolved over a period of a hundred years between the 14th and 15th centuries. Key factors were: 1. the decline of the power of the Church in Europe and rise of strong nation states, such as the city-states in Italy; 2. the rise in education and affluence of the middle class; 3. the increased interest and emphasis on ancient philosophers, particularly Plato, who had admonished humankind to “know yourself” in order to understand the divine; and 4. the development of printing in the mid-15th century that spread new learning throughout Europe. The prosperity and intellectual climate in 15th century Florence created an artistic flowering unparalleled in Western Europe at the time. It is often viewed as the birthplace of the Renaissance. Although many of you may think painting was the preeminent art form of the Italian Renaissance, sculpture actually led the way in the persons of such pioneers as Lorenzo Ghiberti, Donatello, and Bernardo Rossellino. These masters established the Renaissance “requirements” of classical realism: balance, harmony, and a sense of dignity and calm. The stylistic parameters that they established resounded through the fifteenth century. They strongly inspired painters to copy the monumentality and three-dimensionality of sculpture, which were ultimately based on antique Greek and Roman models. Desiderio was from the stonecutter’s town of Settignano, a town where even Michelangelo learned about the properties of Italian marbles. There is a contrast in surfaces between the two sculptors’ work, however. While Michelangelo expertly carved the surface of marble into hard, well defined planes, Desiderio’s contours were more softened and less defined than Michelangelo’s. His works seem to imitate the emphasis of reflected light off of the resilient young flesh. Although Desiderio’s career was short, he excelled in capturing the essence of soft flesh and gently reflective surfaces, particularly in figures of women and children. While the uncarved pupils of the eyes convey a timeless, classical element, the asymmetrical position of the shoulders shows an energy and sense of movement.